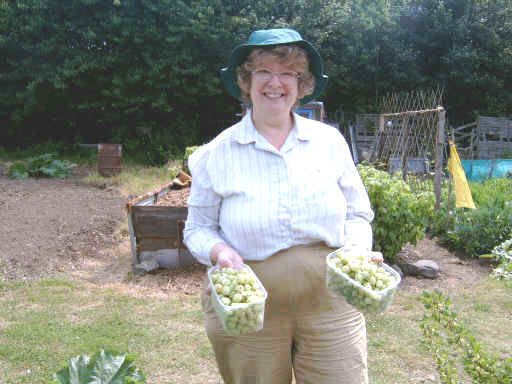 A range of vegetables, soft fruit and flowers throughout the year. Grown as organically as we can manage, using all our own compost, well rotted (one year old) horse manure (no it doesn't pong), to put nutrients and humus back into the soil, which works so hard for us. 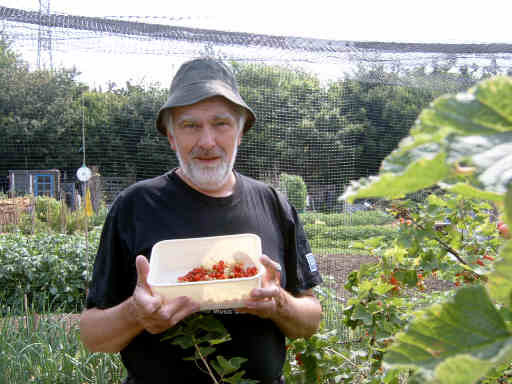 Our own comfrey is cut and put to wilt along the base of our soft fruit. This is supplemented mostly by slow release fertiliser (fish, blood and bone). 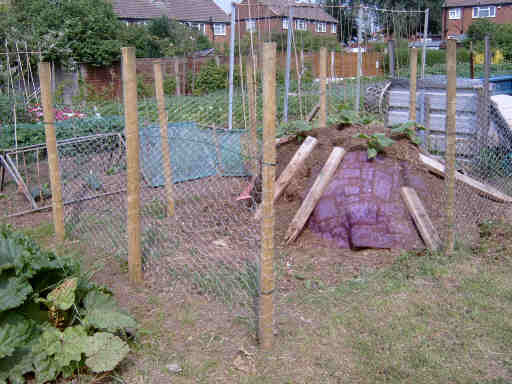 Some proprietary chicken-based concentrated manure is used, garden lime is used where cabbages are to be grown, potash gives the fruit a good start in the season, and nitrogenous feeds are used to kick-start the cabbages after a long winter. 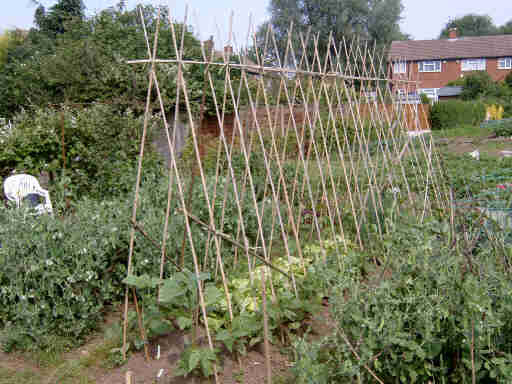 Runner and French Bean canes with 1st crop of lettuce, spring onions, with radishes growing between while the beans are still small. 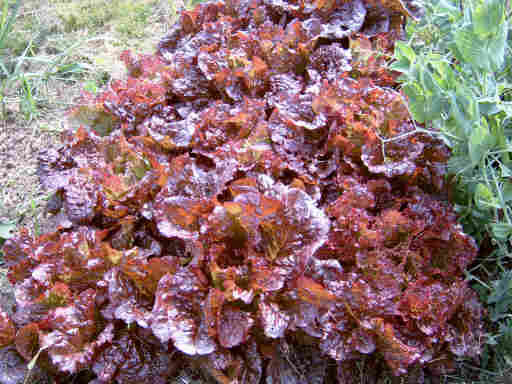 Red lettuce. Redcurrants just started to produce their crop. 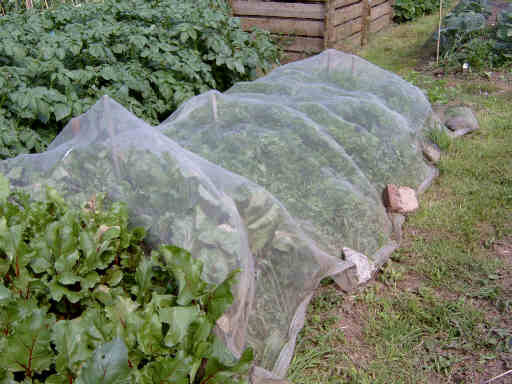 Winter cabbages under netting to protect them from hungry wood pigeons. 2nd crop of lettuce grow between the cabbages while they are small. 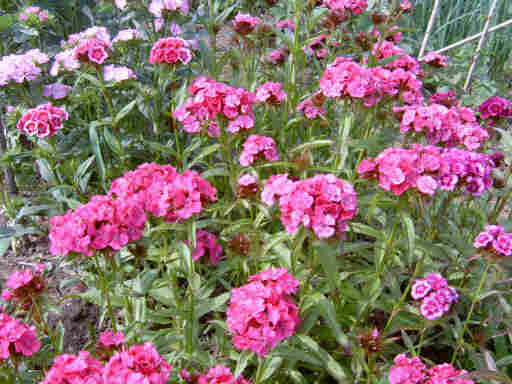 Sweet Williams to attract the beneficial insects and butterflies. 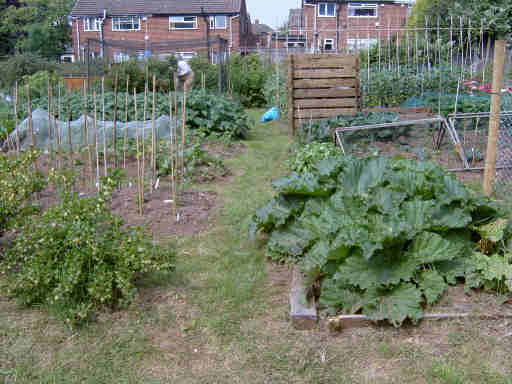 The centre path divides the vegetable and flower plots into two sets of deep beds. 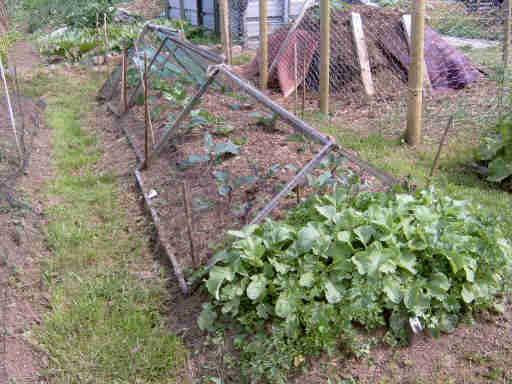 Two varieties of gooseberries to the left, early and main crop rhubarb to the right. Some of the first gooseberries of the year. Carrot crop protected from invading carrot fly by the floating polypropylene mesh. They are under there, I promise! Horse manure bin in the winter, but it grows pumpkins and butternut squashes in the summer.